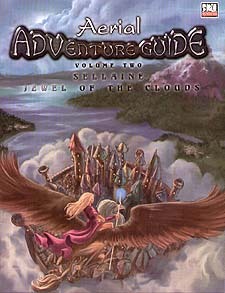 Sky ships, flying castles, cloud cities, and airborne monsters: all this and more awaits you in the Aerial Adventure Guides. These stand-alone sourcebooks contain new character options, races, monsters, feats, items, and adventure ideas, plus aerial combat rules and sky ship design guidelines. Best of all, the aerial adventure guides can be integrated into any fantasy campaign - after all, no matter what world sits at ground level, anything can float above. The series is divided into three volumes. The first covers rules, the second covers settings, and the third covers monsters and items. Each of the three volumes can be used independently, or they can be combined and used together.